Daily deals company Groupon finally began training on the NASDAQ stock exchange on Friday with shares experiencing an initial 46 per cent hike in value. The Groupon float has long been in offing and is one of the most eagerly anticipated tech company IPOs of recent times. The company priced an initial offering of 35 million shares - about 5 per cent of its actual holding - at $20 (£12) a share, but they soon jumped to $29.20 - a 46 per cent increase. A $20 a share, the company is valued at a whopping $12.7 billion (around £8 billion). 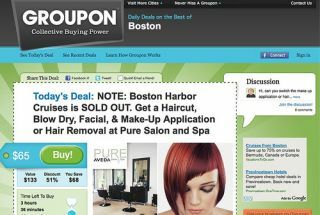 "Today's a significant step in Groupon's journey, but it's not the finish line," a company spokesman said. "We're committed to innovating ways to change local retail for consumers and local businesses. "It's great to pause and recognize what we've accomplished, but we're focused on building a long-term business that really changes people's expectations of local commerce." The IPO, although months in the offing, still caused a little bit of drama on launch day, failing to debut on the NASDAQ until an hour after trading began.